I recently ran across this photo posted on Facebook. It originated from The International Downs Syndrome Coalition. That child is just beautiful! I love the photo. What might surprise you is that what is says it bothered me deeply. My beautiful daughter was placed with an infant rescue organization when her birthmother believed that she didn’t have the ability to care for her. She was a brave but broken woman who found herself in a situation that she could not handle. This was the only option she saw for this incredible human being who was born with a broken body. I have no way of knowing what was said to a frightened woman sitting outside of the neonatal intensive care unit as the child she gave birth to clung to life. What kind of grim picture was painted by the doctors who knew very little about the extra chromosome that wreaked havoc on her forming body? What choices did she think she had when she weighed her options? She had no support at home to raise a child with multiple medical and developmental issues. She had no way of knowing what a beautiful imprint this child would make on the lives of those who know her. She believed that what she was doing was the right thing for her daughter and she was right. She released her to be someone else’s daughter. She loved her enough to place her for adoption. Not everyone with that choice has the strength to take it that far. Emphasizing that this child was “abandoned” is throwing considerable pain on a person who has made the most difficult decision in life. To determine that you do not posses the ability to raise your own child is beyond my own comprehension. Since we don’t know what the birth parents knew or their abilities to care for any child, can we just extend grace? Please understand me, the website that posted this has a great objective. They are educating others on the value of individuals born with disabilities. 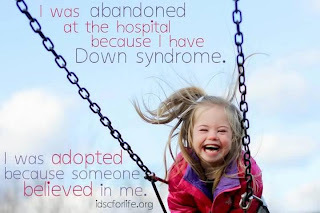 They are advocating the adoption of children with Down Syndrome, I am all over that. Celebrating every life is a joyous thing! While we are celebrating, let us not forget to show compassion to the birth parent who doesn’t have the benefit of education. The frightened family with resources who took the only route they believed they had may have made the tougher choice by walking out. We don’t know. There is no benefit in vilifying them for a choice that led to a better life for that child. We can celebrate the adoption of these children with the reality that it is a difficult task. Adoptive parents aren’t heroes any more than any other parent. What we do makes us stronger if we allow it and when we receive the support we desperately need. 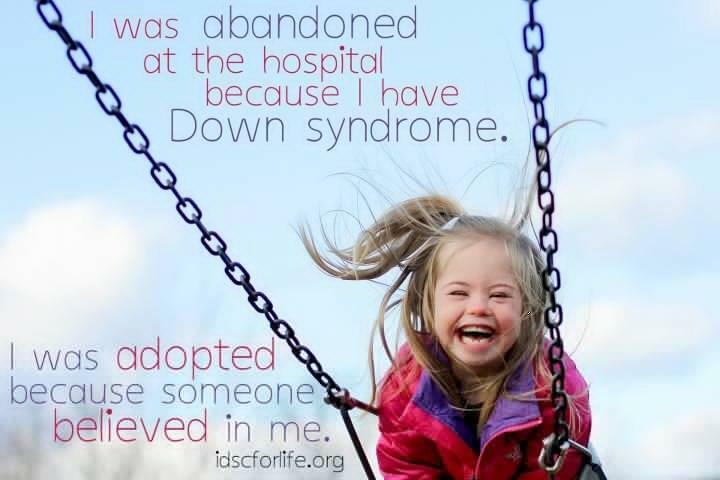 If you want to support the choice of adoption, support the birthparent as well as the adoptive parent. Try to understand that choosing to leave their own flesh and blood at the hospital may have been the most loving gift that birthparent could have given that child.